Writing CFML wrappers for the AWS Java SDK is time consuming and results in verbose, hard to read code. It's not fun reading the java docs and trying to figure out how to wire it all together. A much simpler way to interact with AWS in Lucee is using the AWS Command Line Interface (AWS CLI). If your Lucee server is running on an AWS instance launched from the official Amazon Linux AMI then it already has the AWS CLI installed. If not, don't worry, it's easy to install. "The primary distribution method for the AWS CLI on Linux, Windows, and macOS is pip, a package manager for Python that provides an easy way to install, upgrade, and remove Python packages and their dependencies." For installation instructions see ... Installing the AWS Command Line Interface. In order to run commands and manage your AWS services using the CLI you'll need to setup some environment variables. 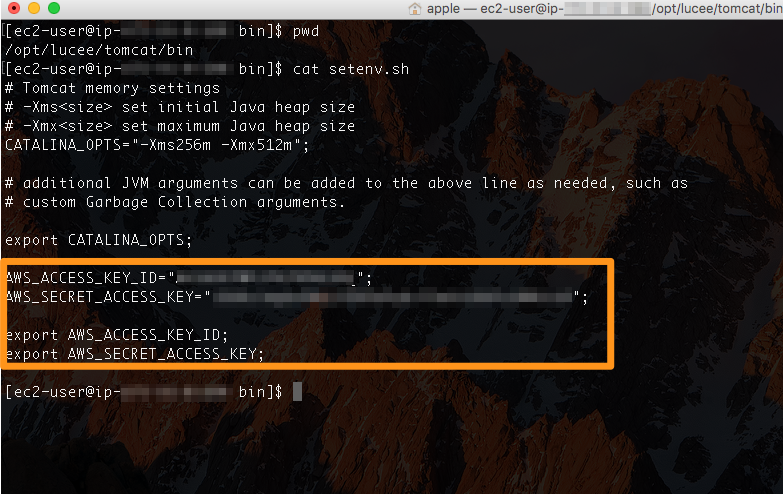 You really only need to setup variables for the AWS_ACCESS_KEY_ID and AWS_SECRET_ACCESS_KEY. My Lucee install path is /opt/lucee (your installation path may vary). Add these 4 lines to your setenv.sh file. Replace my dummy values with your actual keys. Here's some quick sample code to get you started. Lookup your desired commands in the AWS CLI Reference and modify the cfexecute command above as needed.